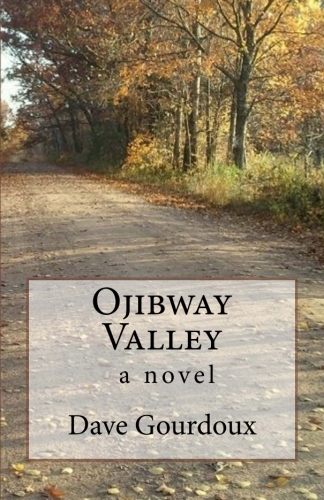 The setting for much of my second novel, and for the recent short story I posted here called “The Silence,” is the fictional Mayflower Hotel in the fictional northern Wisconsin town of Neil. While the events I’ve written about are completely made up, the Mayflower Hotel is based upon the very real Gerard Hotel in the town of Ladysmith, Wisconsin. I lived in an efficiency apartment on the third floor of the Gerard from August 1977 until December of 1978. I was eighteen years old when I moved in, and had just turned twenty when I moved out. It’s a grand old building, rising high from the tall banks of the Flambeau River, and can be an imposing and eerie sight on mornings when mist rises from the river. I’m not sure why I’ve been drawn to write about it so much lately, why I’ve set so much of my fiction there. I have vivid memories of what the place looked like, and how the midday shadows hung in my apartment, and how I’d look out the dormer windows from my bed and see, every night before going to sleep, the red blinking of a radio relay tower on the other side of the river, and how when I opened my eyes in the morning, the same blinking red light would be the first thing I saw. Last week, on Wednesday morning, while I was up at my cabin, I had to run to Ladysmith for some errands. 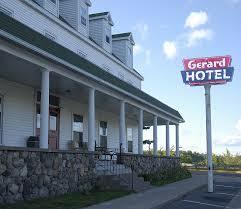 I had a little time to kill, so I thought I’d stop by the Gerard Hotel and check it out. Maybe I could talk to the current manager and have a look around. I parked in front of the hotel, the same place that thirty seven years ago I’d park my first car, a green 1974 AMC Hornet, and I walked up the steps past the little stonewall and the white columns and once again I stood on the immense front porch, and I put my hand on the doorknob and tried to open the front door. It was locked, and there was a note taped on the door that tenants were to leave it locked. I couldn’t remember if we left it locked when I lived there or not, but it made sense, at least in 2014, that they wouldn’t want people wandering in off the streets to bother the residents. I peeked through the glass of the door, and I was surprised at how small it looked inside. The lobby was hardly a lobby, the stairs that I always had to climb to get to my apartment were right behind the front door, and the front desk, where the manager sat and where I’d pick up my mail, was only a few feet to the right of the stairway, and was small and cluttered. I looked to see if anyone was behind the desk, someone who I could ask to let me in, but there was nobody. I looked inside for a while longer, and I wondered, did the hotel show its age as much when I lived there, or was it the additional thirty five years since then that had taken its toll? I stepped back and off of the porch, and I could see on the side a hole had rotted out of the porch’s stone foundation. The exterior looked like it could use a fresh coat of paint. Travelers arriving in Ladysmith by train in the early 1900s were met at the depot by representatives of the various hotels. Patrons looking for the finest hotel in town most certainly would have stayed at The Gerard. When it opened in November of 1901, the Gerard was regarded as “the most modern and complete hotel between Minneapolis and Rhinelander,” according to the “Gates County Journal.” The hotel featured new furnishings and steam heat. Electric lights were added after the Ladysmith Light and Power Co. plant was completed in November of 1902. The hotel, itself, is both charming and stately. The white clapboard exterior and third story dormers are characteristic of buildings from the colonial era. The hotel seems more imposing than it actually is because one normally approaches it from the south and sees the long view of the building and its expansive porch. The effect would not be the same if the building could be approached from the front. The Gerard’s most distinguished guest was Thomas Marshall, Vice President of the United States, who stayed there while in Ladysmith to give an Armistice Day speech in 1920. Governors and other notables, including James L. Gates (afterwhom Gates County was named) feasted there. So the hotel was seventy six years old when I moved in, and now is one hundred and thirteen. I was eighteen in 1977, and now I’m fifty six. I’m still a pup compared to the Gerard, but like the Gerard, I’ve weathered and rusted, and like the floorboards of her porch, I creak and ache. So while the place has become fertile ground for my imagination, the truth is that my time there was lonely and unexceptional. Maybe that’s why I romanticize it so much; nothing much of real interest happened to me there. Maybe I’m trying to recreate that time and make it more substantive than it was. Maybe I’m creating my own personal mythology. Maybe it’s because I was young and healthy then, and I’m older and broken now. Maybe it’s because I look back at those days and long for all of the youth and freedom that I so carelessly burned up. Maybe it’s because I know that Hotels and people wither and fade. I’m old enough now that I look back on the days when I was eighteen to twenty with a heavy dose of romanticism. My past is looking more and more like a bad Bob Seger song. The truth is, while I was physically stronger and leaner, I didn’t know anything about anything. There’s a Seger song that contains the line “wish I didn’t know now what I didn’t know then.” What a load of crap. I recognize that I was a complete and total idiot at age 18, and if nothing else can be said about the almost forty years since, I am happy to report that I am at least somewhat less ignorant today. I can fictionalize my memories of the Gerard as much as my imagination will let me. It remains a beautiful, unique and spooky setting for whatever stories I might decide to tell. But I have to remember that, in the words of that great Motown group The Temptations, it’s just my imagination, and not let it run away with me. If I really think about it, and take off the romantic lenses I view the past through, I’m happy where I am, loose floorboards and peeling paint and all. I didn’t realize you were so close to Ladysmith. I have cousins there. Will send them a link to your blog. Thanks, this is lovely. Your Gerard is elegant and rich with history overlooking a beautiful setting. From it and your life experiences have come your human stories. They contain some of you and your sense of change coming from the past into the present. This was like seeing “baby” picture of you. Thank you. Just went past the Gerrard and did a quick web search only to find your delightful story. My great, great grandfather A.S. Tinker ran this hotel in in it’s grander days. And I have old and newer pictures and an original framed rates placard. Love your story. In order to go to high school in Ladysmith (I am guessing sometime around 1935ish? ), my mother had to leave the family farm outside of Conrath to work as a maid and live at The Gerrard. Whenever I think I have it tough I think about what she had to do to get an education! 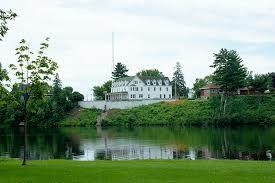 My grandparents had a home on the flambeau not far from the Gerard. You have put into words my feelings of their home, so maybe the river, being the common denominator, is why these buildings hold on to us so tightly? Would like to edit the there to their. Ahem. Eve, it might very well be the river that connects us to these landmarks – or it might be that buildings like people weather and fade and age or maybe a combination of both, that the river is steady and constant enough to remind us of what we and our world were before the onslaught of age and time … or maybe I’m just full of you know what! Anyway, thanks to you and all the others who liked my little article – it’s very much appreciated! I Really Enjoyed reading this. Thank You for sharing with us!